Some charts and data referenced in this article are derived from the Reception Perception methodology. For clarity on these unique stats, please use this reference page. Every year there are several NFL teams whose wide receiver corps presents headaches for fantasy owners. This is particularly true in cases where an offense experiences major turnover, and brings in new faces. Sifting through these crowded quagmires are a challenging, but necessary evil for those interested in making a run at a fantasy league championship. One receiver group that lacks immediate clarity is that of the Miami Dolphins. With the departures of Mike Wallace, Brian Hartline and Brandon Gibson, The Miami Dolphins let over 200 targets walk out of the facility. All three of these receivers were players that the team had previously invested big resources in. With all three, but particularly in the case of Wallace, the Dolphins were disappointed in the returns. Nevertheless, their roles will need to be filled if the passing game, and Ryan Tannehill are going to continue to develop. Fortunately, the Dolphins front office left no stone unturned to reinvigorate their pass catching group with bodies. The team used the free agent and trade markets, while also exhausting a first round pick, in their attempts to add talent to the arsenal. These new additions certainly make Miami’s offense more interesting than it has been in prior years. Yet, the crowded group also looks to be a hotbed for fantasy football headaches. Kenny Stills, Jordan Cameron, DeVante Parker, Greg Jennings, and holdover Jarvis Landry each possess unique skillsets in relation to each other. There should be specific spots and roles for each player to fill in the passing game. The key for fantasy owners will be sorting through the group to try and find some clarity. One of the castoffs from the New Orleans Saints’ early offseason fire sale, Kenny Stills was sent packing to Miami for a third-round draft pick. A curious move at the time, as Stills is widely regarded as a solid field stretcher, and an ascending young player. Not long after, the Dolphins sent their own deep threat away, by trading Mike Wallace to the Minnesota Vikings. As pure deep threats, Wallace and Stills are in the same class. 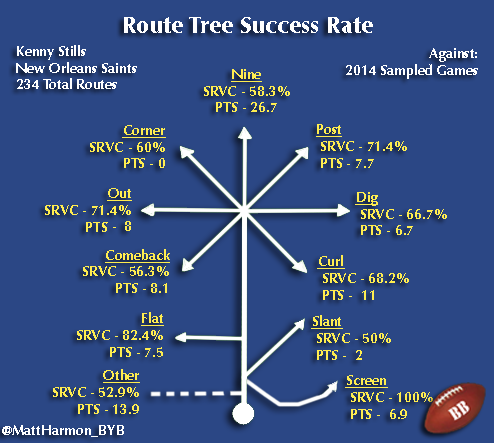 Both maintained SRVC scores in the 50% range on their nine routes. Both players’ figures are above the charted NFL average for that particular pattern. Their corner and post route scores fall in the 60 to 70% range. Stills slightly out-produced Wallace on go routes, recording 26.7 PTS over his eight-game sample, compared to 22.2 PTS from Wallace. What Reception Perception quantifies is the idea that Kenny Stills should seamlessly take over the field-stretching role from Mike Wallace in the Dolphins’ offense. The organization overpaid for Wallace’s services several years ago, and expected him to be more than that. Ironically, problems with the deep ball were a staple of the mercurial receiver’s time with the team. While Ryan Tannehill is far from a proficient deep passer, some of the blame lies at Wallace’s feet too. The veteran receiver had trouble getting on the same page with his quarterback. Which manifested itself in poor ball tracking, and running at consistent speed in his routes. As such, Mike Wallace posted a 66.7% contested catch conversion rate on 12 attempts over his Reception Perception sample. That figure is right around the NFL average. Kenny Stills, on the other hand, recorded a sterling 80% contested catch conversion rate on 10 attempts over his sample. The younger receiver showed better ability to be in the expected spot, and adjust to the ball than Wallace. The vast difference in these success rate statistics gives some optimism that not only will Stills replace Wallace, but also the Dolphins may actually leave less long plays on the field this year. Reception Perception illustrates that Kenny Stills should provide the Dolphins with a fine replacement for the departed Mike Wallace. The question for fantasy owners, is how much of the passing pie will Stills command? Wallace was thrown at 108 times last year, per Pro Football Focus, good for 18.3% of Tannehill’s passing attempts. Because his role and game are so specific, Jarvis Landry and Greg Jennings should not threaten Stills. Whether he reaches that volume will depend mostly on the development of DeVante Parker. If Stills manages to impress this summer, and Parker takes a little longer to get off the ground, the veteran could approach, or pass, Wallace’s 2014 target level. Should that end up being the case, Stills will hold solid WR3 value; with the possibility of major scoring weeks, due to his big play ability. Of course, you must be prepared for variance in his play, and that his targets may taper off as Parker gets more comfortable. At this early stage, Stills’ ADP looks pretty friendly, in MFL10s and best ball formats especially.